Ceilings are often overlooked as a space to get creative but adding some interest up there can really make a difference. There are many options for jazzing up the ceiling, painting it a bold color can be fun, lacquering has become very popular and adding a 3 dimensional element is always a good choice. Here are some ideas if your ceiling needs some excitement! This room has a soothing blue and taupe color scheme, the ceiling is painted the same color as the walls which really brings the eye up. Also painting the trim white makes it pop from the dark walls and keep the space from being boring. This room has a similar idea to the previous image, but the fabric choices make the overall look much more bold and the bead board is an interesting detail. I love the way the designer painted the walls and ceiling the same blue and kept the wainscoting white. Although the space is done in cool colors the lack of crown molding makes the room feel quite cozy. This dining room has a mid-century feel with a twist, the ceiling is painted blue down to just above the picture molding and all of the molding is painted the same as the walls. This look may not be for everyone but in this space it is quite lovely. This kitchen is painted in the old southern tradition of blue ceilings, typically porch ceilings are painted this shade of blue to ward off bad spirits and keep bugs away. This traditional kitchen has beautiful wood floors, classic marble counter tops and the ceiling adds some freshness! Now this is what is call a ceiling! Lacquer is a classic style that seems to come and go, right now we see it everywhere but I would not be afraid. 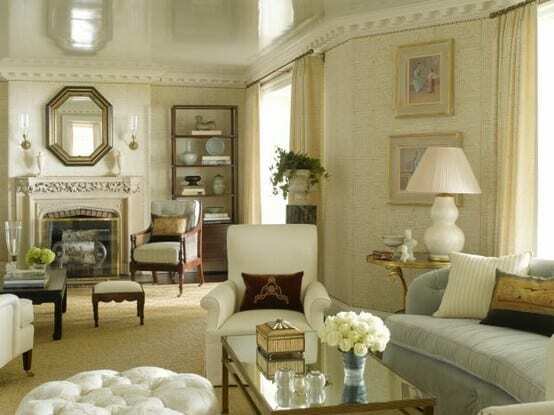 This room is mostly white with pops of neutrals, the white lacquer ceiling with molding detail is remarkable and creates an intimate setting. This space also has a white lacquer ceiling but the grand crown molding and traditional furniture are very elegant, the natural light reflects beautifully on the ceiling and gives a great glow. Here we get crazy, an orange lacquer ceiling in an otherwise classic dining room. I find this to be absolutely wonderful, the reason it is successful is the simplicity of the rest of the room. If you love the idea of a painted ceiling but aren’t exactly sure which way to go, we here at Nandina Home & Design are happy to help. Let’s go crazy!